Last updated 17 January 2019 . By Olivia Cheves. 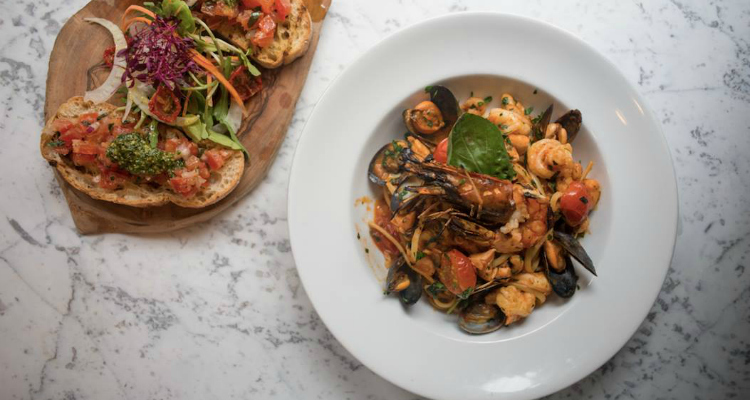 Offering a host of classic Italian dishes, you'd better believe 40 Dean Street know how to craft a good bowl of pasta. Through the huge front windows of 40 Dean Street you’ll see all sorts: theatre-goers speeding past, tight-lipped, clutching tickets, already late; Friday night revellers looking for good music and reasonably priced glass of wine; and sharply dressed figures being ushered through the doors of Soho’s members clubs. You might also see my dining companion for the evening walking past a couple of times with increasing panic before spotting the door. Tucked away amongst the awnings, it’s part of this Italian restaurant’s charm, that, despite sitting on the same plot for two decades, it’s flown below the hype radar. While it's by no means empty when we arrive, it hasn’t given in to the hectic turnover demanded of many a Soho eatery, and with a recent refurbishment giving it a very swish new look, it was time to get a taste of the goods before our chances of even getting a table diminish entirely. We start by getting to grips with their bresaola (£8), wafer thin circles of cured beef topped with salty, truffle-oil doused rocket that washes down a treat when combined with a cold glass of fizz (£6). You’d be a real fool to come to this family-owned spot and not try the pasta. Offering big, hearty bowls of the stuff in all manner of shapes, sizes and sauces, you can chow down on everything from pesto pappardelle to lobster ravioli. The spaghetti aglio e olio (£12.90) proffers slurpable spaghetti topped with giant prawns and a gentle nudge of chilli, while the tagliatelle with beef and tomato ragu (£10.50) is satisfyingly rich and pairs wonderfully with a glass of Nero d’Avola Tola (£6.50). For dessert the chocolate brownie (£5.50) calls. A dense slab of fudgey dark chocolate with hints of boozy cherry liqueur and vanilla ice cream. There’s a reason 40 Dean Street has stood the test of time and rampant gentrification and it comes down their commitment to authentic, wholesome food and stunningly reasonable prices. For relaxed service and simple pleasures, this Soho staple is as perfect for a quick bite as it is for a drawn-out dinner with your nearest and dearest. 40 Dean Street is open every day from 12pm-12am at 40 Dean Street, Soho, London, W1D 4PX.